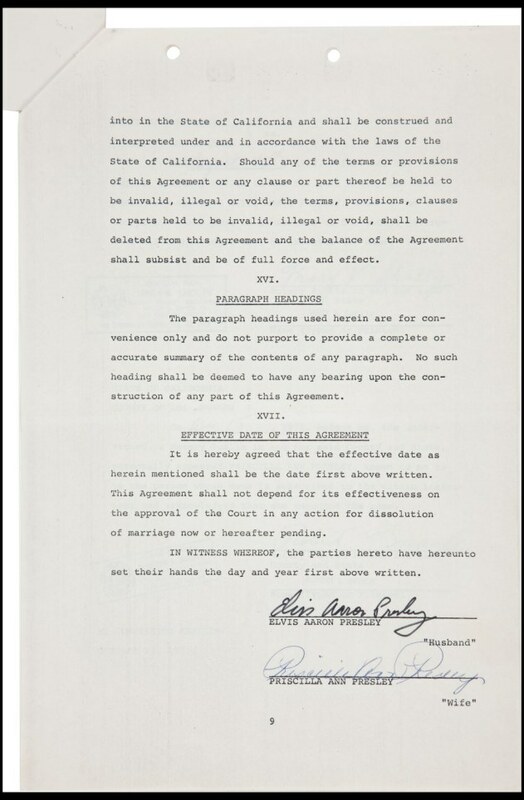 These legal papers would have undoubtedly left Elvis Presley all shook up. 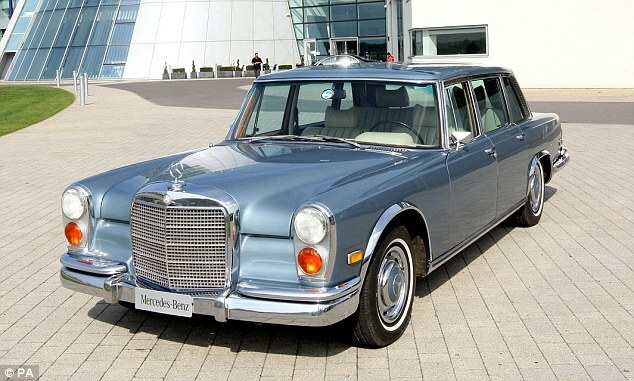 They are the divorce documents that legally handed over part of the King's beloved fleet of cars and a top-of-the-range motorbike to his estranged wife. 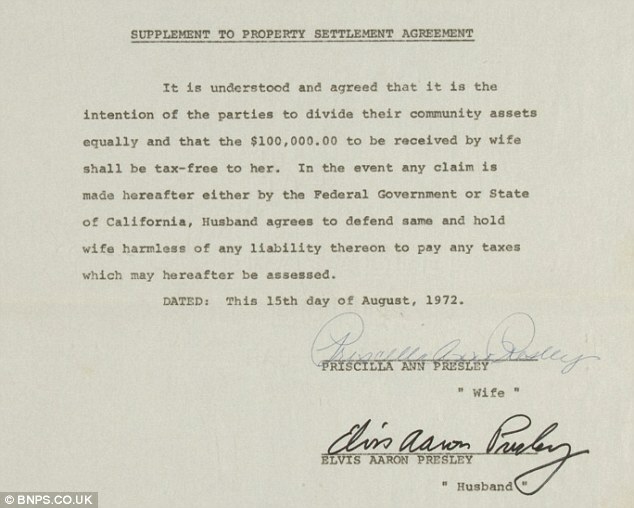 Elvis and Priscilla Presley split up in 1972 and drew up a property settlement agreement to outline what she should receive from the divorce. 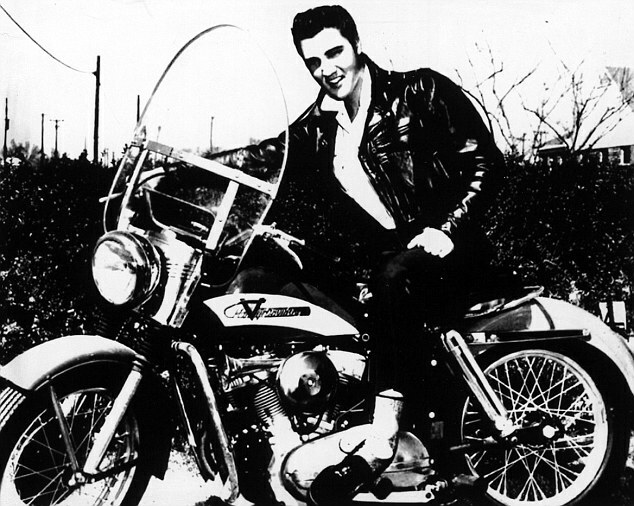 The original papers, that were sold last night at auction in Texas for nearly £6,000, show Elvis signed over ownership of three of his prized possessions - a 1971 Mercedes-Benz car, a 1969 Cadillac El Dorado and a 1971 Harley Davidson motorbike. The documents also show Priscilla had originally agreed to a cash settlement that was 7.5 times less than the amount she finally received. As well as Elvis' cars and cash, actress Priscilla also stood to receive half the income from the sale of their three properties in California. 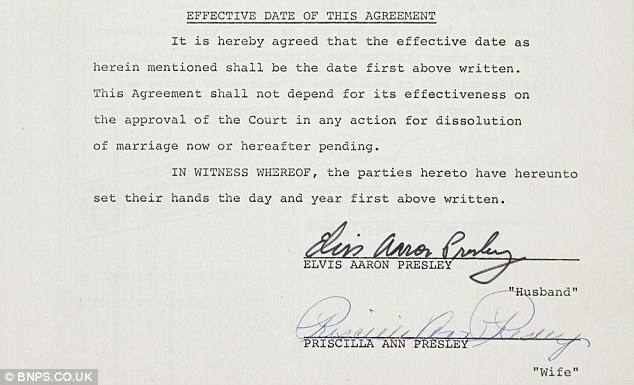 The document, which is signed by both Elvis and Priscilla, has come to light after its unnamed private owner sold it at an online auction after having it for 20 years. 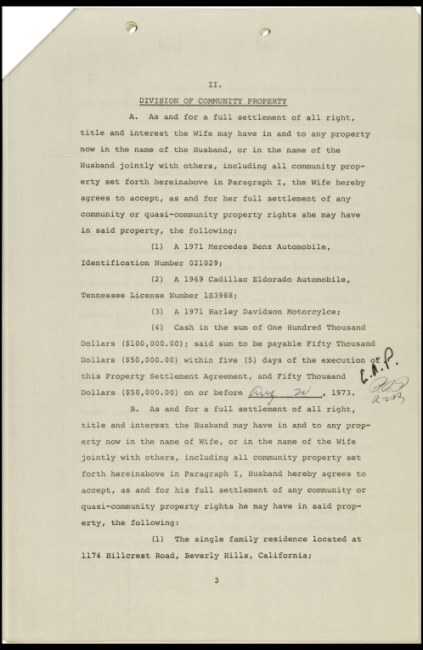 Margaret Barrett, of Heritage Auctions of Texas, which sold the paperwork, said: 'These types of documents always give people a fascinating insight into the lives of the rich and famous. 'It is a side of their lives that previously only they and their lawyers would get involved in. 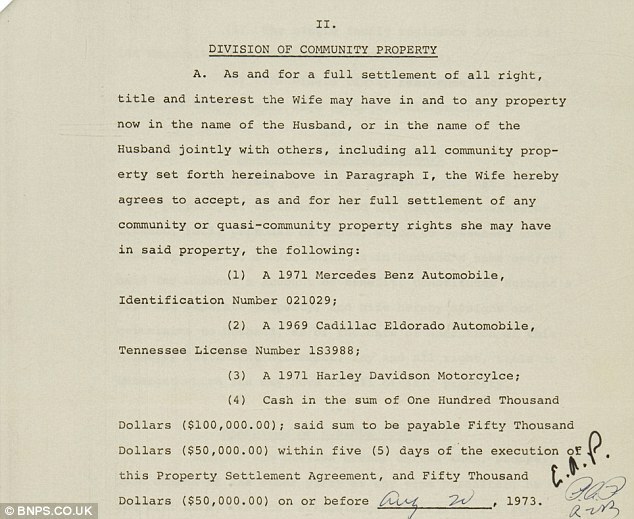 'The agreement granted Priscilla ownership of a 1971 Mercedes Benz, a 1969 Cadillac El Dorado, a 1971 Harley-Davidson motorcycle, $100,000 in cash, and half the income from the sale of their three houses in California. 'It is initialled in ink by Elvis and Priscilla on page three and signed by them on page nine. 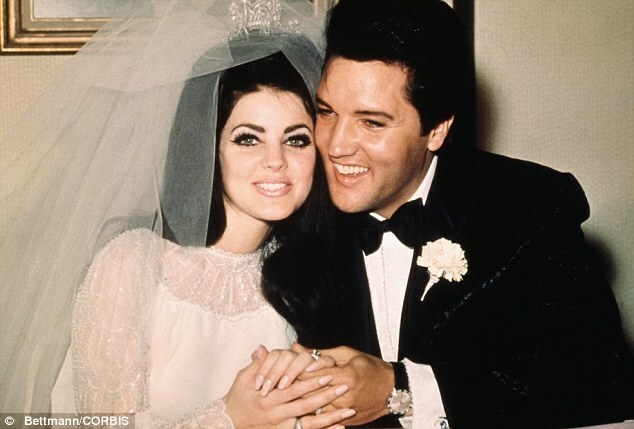 Elvis and Priscilla met in 1959 and married in May 1967. 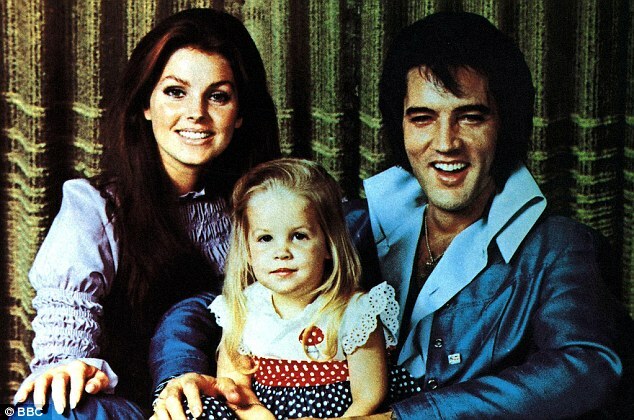 They had a daughter, Lisa Marie, but split up in 1972 and formally divorced in October 1973. It reads: 'The parties were married on May 1, 1967 in Las Vegas, Nevada. 'Unfortunate circumstances and unhappy differences have arisen between the parties by reason of which they have lived separate and apart since February 23, 1972, and by reason of which they intend to dissolve their marriage. 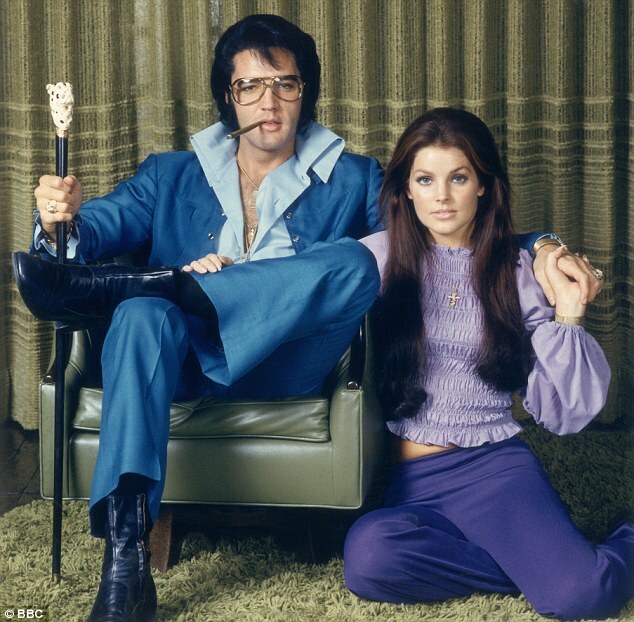 Smooth: The King and Priscilla were formally divorced in 1973.